On May 9th people every where take a moment to stop and reflect on the many socks that mysteriously go missing. They escape at the laundromat, behind the dryer, outside the aquatic center or left behind at the bowling alley. So today we remember all those socks who have lost their match and take this holiday to look forward and not back to a time without lost socks, a time when sock sorting is a thing of the past! 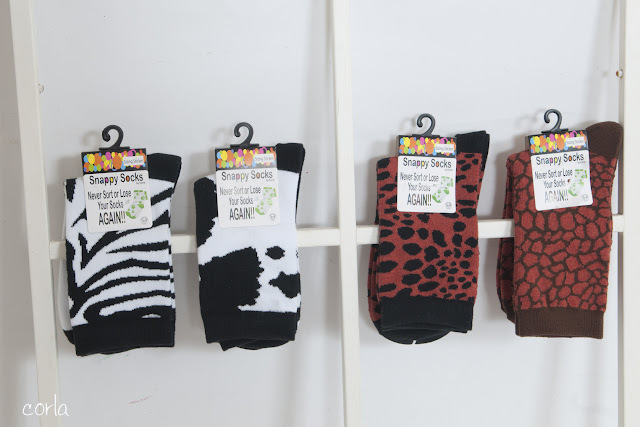 Here is the latest news from Snappy Socks. The two socks that snap together when you wash and dry them so you never have to lose another sock again. This is a "Sneak Peek" of the styles coming very soon! Here are some of the Ladies "Animal Prints"
The Ladies "Plain" and "Dots"
Some of the kids "Dots" and "Dawgs Paws"
If you would like to win some Snappy Socks please comment on this post for a chance to enter and then head over to my Facebook page for a chance to enter another set of 9 pairs socks. I will be giving away 2 sets of socks that will have 8 of our original styles of socks and 1 new style that aren't available for sale yet so altogether 9 pairs to celebrate May 9th!! The winners will be chosen on Monday. Good Luck and Yay for no more Lost Socks! Love the new designs Corla! Congrats to the Dyrland Family!